Explore Aspen’s Maroon Bells, the most photographed mountains in North America, and discover how a journey through over 300 million years of jagged stone inspires travelers from around the world to Defy Ordinary. The Maroon Bells, a series of distinctively bell-shaped, wine-colored peaks towering 14,000 ft. above the pristine, glacial Maroon Creek Valley, offer some of the most spectacular natural views in the world. 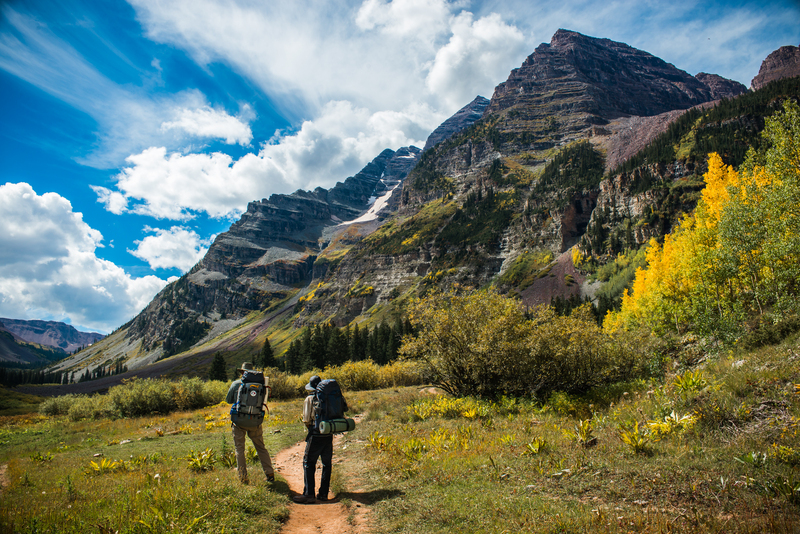 From meadows of vibrant wildflowers to airy groves of Aspen trees to summit-based alpine tundra, the Maroon Bells promise a variety of natural habitats and a diverse, vivid representation of the wild Elk Mountain range. With six scenic hiking trails, various camping sites and biking paths, visitors can enjoy multiple ways to access Aspen’s natural marvels and endless mountain adventure any time of year. As the most photographed peaks in North America, the Maroon Bells promise premium views and amazing access to Aspen’s natural wilderness. Capture the perfect shot as you wander the Maroon Lake Scenic Trail. For the most serene (and least crowded) experience, visit on a weekday. The Maroon Bells are conveniently accessible by bus from 8 a.m. to 5 p.m June 9 through October 8. Bring your four-legged friend along for a hike! All of the hiking trails surrounding the Maroon Bells are pet-friendly, but pets must be on a leash. Call the Maroon Bells Hotline for up-to-date parking and scenic area information at 970-945-3319. The road is approximately open from Memorial Day weekend through November. For camping and road closure information please call the US Forest Service at 970-925-3445. During the spring at the Maroon Bells, it can feel like you have the peaks all to yourself, beginning Memorial Day weekend, when the road opens to cars, through June 8. This is a prime season to enjoy the open meadows, abundant wildlife and lakeside sunrises. These stunning wine-colored peaks are our number one summer destination. For the best visitor experience, we recommend visiting mid-week and utilizing the bus. Leaf peepers should visit September to mid-October. Peak foliage is often the third week in September but varies year-to-year. Cross-country ski or take a snowmobile rideto the snow-capped peaks for an experience unlike most. Maroon Creek Road is closed from mid-November through Memorial Day weekend, so the peaks are not accessible by car. During this time, you may also enjoy a five-mile walk along the snow-packed road with stabilizers from the closure gate to the Maroon Bells. For your safety, please be aware of avalanche risks. 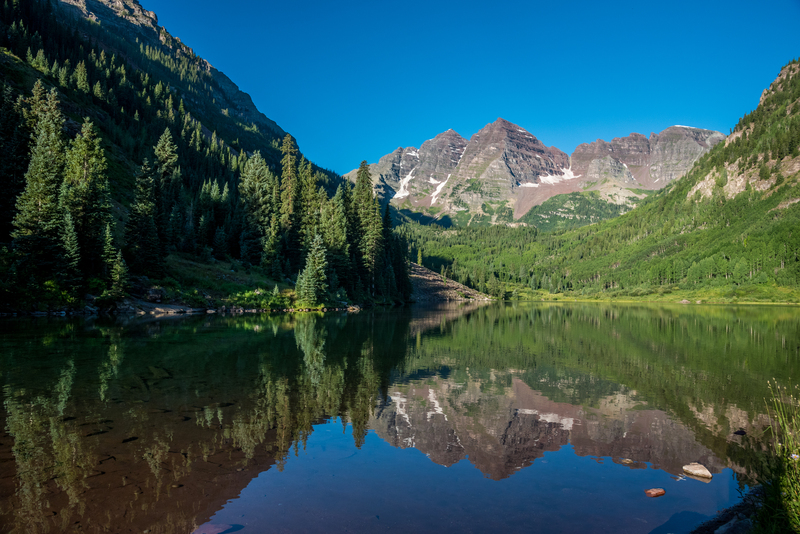 Get out for a Maroon Bells hike with six pet-friendly trails of varying lengths that will guide you to the perfect picnic spot alongside fields of wildflowers and the pristine Maroon Lake. Experience a night under the stars in the Maroon Creek Valley at one of the three campgrounds available during the summer season: Silver Bar Campsite, Silver Bell Campsite and Silver Queen Campsite. 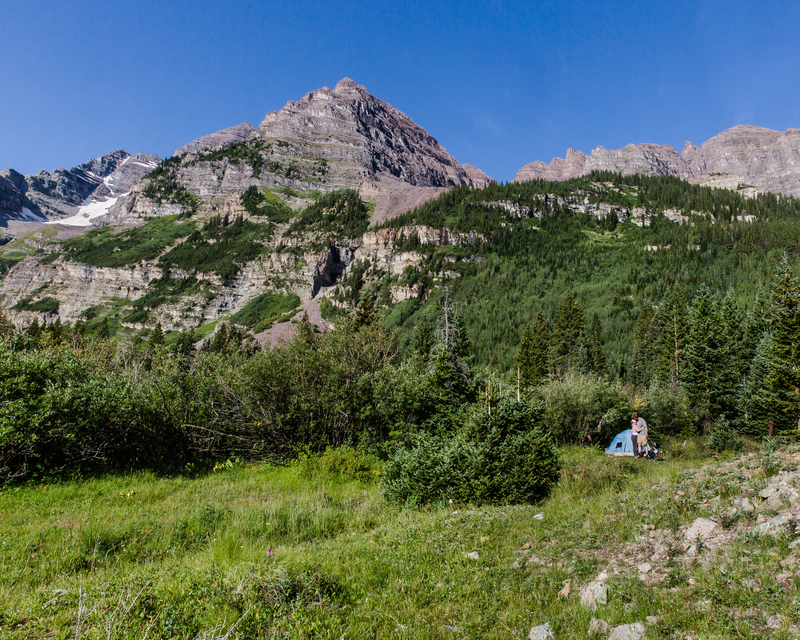 Backcountry camping is also available for travelers ready to take on the rough mountain terrain and discover the untamed, beautiful wilderness of Aspen’s Maroon Bells. Maroon Lake is the anchor to Maroon Bells. Arrive by bus, bike or car and this glassy landmark will be the first to greet you. The mountainous peaks paired with the lake’s glossy reflection create a breathtaking scene that have manifestly held the title for the most photographed mountains in the country. Snap your picture-perfect shot and share it with us by tagging @VisitAspen. Travel by bus, by car or by bike to the Maroon Bells with ease using these tips. We encourage you arrive by bus or by bike for the most convenient, cost effective and eco-friendly experience.